You might have tried the rumble seats around town, but have you tried the 4DX theater at the Regal Cinemas? Over the dead time that is the holiday season we finally tried it out and boy van we tell you it's not worth it. At $30, when not a matinee, it's very not worth it to flail around in the theater. 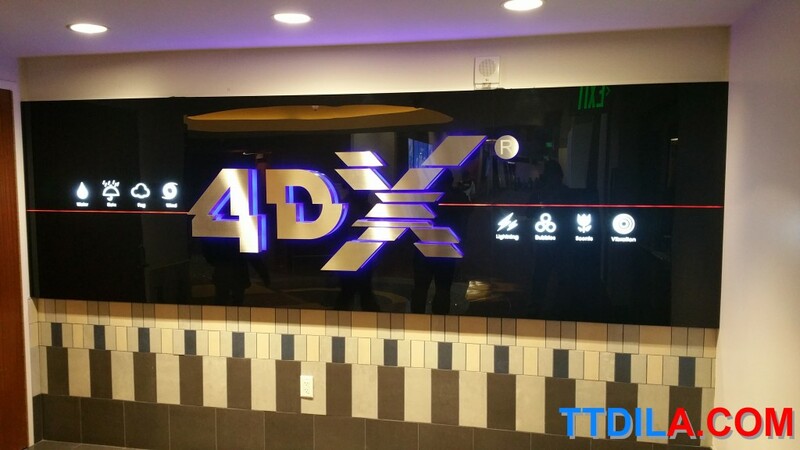 Check out times and films playing in 4DX here. Now this theater has been around for 2014, we haven't heard any reports as a must-do from any other sites about LA and we now no why. This baby was the first of it's type in the US from the same people who own the CGV Cinemas, the Korean brand theaters, so it's already kind of strange why it's at LA Live and not at one of their brand of theaters. For our 4DX trial run we went for an action sci-fi war movie, the perfect choice for an all out experience, that's right, we saw Rogue One. And it did not save that film. If having your seat move in tandem with X-Wings in dog fights in space can't entertain then you should give up on the idea. When laser shots fired and we had air shoot past our heads it was cool...at first. When the air puffs didn't stop it got annoying. Lightning was simply a light going on and off in the theater. Seats moved and I can hardly say any of the promised effects were programmed or occurred for the film. Rain and bubbles didn't occur in the movie, so we don't blame them for not being done, we would have loved to have seen the snow effects, but you are on a beach in the film shots never did we feel any water droplets that I can remember. The promise of scents; if any occurred I couldn't say I smelled them. It must be hard to program what is to occur as I'm guessing it's up to the people who make 4DX as to what needs to happen, not anyone involved with the film, so it's kind of a strange idea that someone is formatting your experience other than those who created the film. I'm not a fan of rumble seats myself, they really add nothing to the experience for me. That's still the basic idea in the theater and the other ideas really don't add up or at least on my trial. My suggestion would be CGV would need to create films itself to match a fully utilized the experience perhaps. If you've read my reviews of CGV films though I think of them being so bad there good for the American Market, so I don't see that being possible. The 4DX experience won't really make your movie watching a better time. It may hinder getting lost in the film when you seat shakes every few seconds.